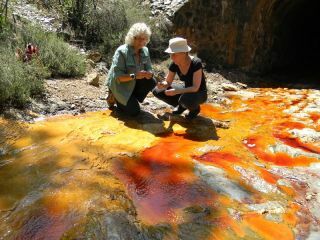 Acid mine drainage, shown here in Rio Tinto in Spain, has a distinctive color when viewed remotely, as does the red algae which can live there. In this image, Penny Boston and Cassie Conley sample the acidic waters. In the rapidly advancing field of exoplanet research, it always helps to be one step ahead. A handful of rocky exoplanets have been discovered to date, and it is only a matter a time before the floodgates open and the number of known terrestrial exoplanets skyrockets. These planets could bear alien life, but how do we know which ones are worthy of a detailed inspection? The most basic criterion when looking for habitable planets is that they should have liquid water, as liquid water is essential for life as we know it. Another criterion is to search for habitats in which life is known to exist on Earth, and a new study by Siddharth Hegde and Lisa Kaltenegger at the Max Planck Institute for Astronomy in Germany has revealed a method that will do just that. Organisms that can live quite happily in extreme environments, known as extremophiles, define the boundaries of habitability. By identifying the colors of environments known to be a haven for extremophiles on Earth, it is possible to search for similar environments on planets that are akin to our own. Octopus Spring in Yellowstone National Park is home to microbial mats that have a distinctive color. When looking at light reflected from Earth, there are many signs of life embedded within the spectrum. One such example is that of vegetation, as the chlorophyll in plants reflects more light in infrared light than it does in visible light. This feature has been dubbed the “red edge of chlorophyll” or the “vegetation red edge”. Expanding on this idea brings to light the possibility of looking for distinctive signals of extremophile environments. Extremophiles can tolerate environments that would be inhospitable to human beings. For example, thermophiles can withstand blistering heat, psychrophiles can survive in freezing conditions by creating their own antifreeze, and endoliths live within rocks by munching on sulfur or iron for food. Multiple species have adapted to a particular type of extreme environment, showing that this kind of adaptation is not a fluke and extremophiles could exist on other planets. The majority of extremophiles hide beneath the surface to shelter from harsh conditions or gain access to nutrients, so the light reflected from the surface will not necessarily reveal their presence. However, the study by Hegde and Kaltenegger looks at several examples where extremophiles could be detected on the surface, along with environments that would harbor subsurface organisms. These surface extremophiles included red algae, which can live in toxic environments such as acid mine drainage, and lichens, which are dessication-resistant and can survive in hot deserts. They also looked at the color of a microbial mat, where bacteria combine themselves with sediment, in particular one mat created by two types of thermophiles at Octopus Spring in Yellowstone National Park. The environments that extremophiles inhabit have distinctive reflectivities, or albedo, at certain wavelengths. For example, water will reflect less light than snow. The scientists have used a “color-color diagram” to see which extremophile environments could be detected remotely. A color-color diagram of the Solar System shows how the color of planets puts them in unique place on the diagram. Similarly, certain surface environments will have a unique color that makes them identifiable. This technique uses what is known as filter photometry to characterize planets and their environments. The light from a planet is split into three different filters at the telescope, which corresponds to three different regions of the spectrum and thus three different colors: blue, green, and red. By plotting colors against each other, different environments are shown to have a unique place on the diagram. In a color-color diagram of the Solar System, the blue marble that is the Earth is placed in its own corner of the diagram, where as Mars, the Red Planet, is at the other end of the diagram. The amount of light passing through a particular color filter is unique to the type of environment, meaning that the color can act like a fingerprint to identify it. By recognizing that a certain color equates to a particular type of habitat, a follow-up investigation could search for signs of life in that habitat. For example, endoliths are known to live within sandstone, so the detection of sandstone could indicate a habitat for extremophiles. The color-color diagrams also show that certain environments group together. Snow and salt have similar colors, and another group is comprised of sand, bacterial mats, and lichens. The amount of water present on a planet relative to the extreme environment will move its place in the color-color diagram. As the atmosphere of the early Earth was anaerobic, i.e. devoid of oxygen, the scientists also constructed diagrams that included environments of anaerobic organisms. Lichen is a familiar sight on rocks, but it can also inhabit inhospitable areas such as hot deserts. The color-color technique is not without its limitations. If a planet is completely shrouded in clouds, then no surface features will be visible. However, if the light signals are of very high quality, then it is possible that some clouds could be artificially removed. The specific colors used to identify organisms bearing chlorophyllwill change around other types of stars, making it difficult to use this technique. This study only looked at Earth-like planets around Sun-like stars. However, a star hotter than Sun will emit most of its energy at a lower wavelength. This could result in a “blue edge” of chlorophyll, as plants reflect the high energy radiation away to protect themselves. While some exoplanets have been imaged directly, it is not yet possible to see the light from Earth-like planets. Their presence is inferred indirectly, for instance NASA’s Kepler mission can detect Earth-like planets from the amount of starlight they block as they pass in front of their host star. The use of filter photometry and the color-color diagram will likely be the first step taken once direct detection becomes possible, and thus it will be an important step towards finding extremophile life on exoplanets.